SPECIAL NOTE - We have a matching Moog 953 Duophonic 61 Note Keyboard in Walnut available to pair with the IIIc for $1099. Please let us know if you are interested! The latest model in the Moog Legacy Modular series has just been announced. The original Synthesizer IIIc is coming back in extremely limited quantities. Â 25 units are being built for the world and of those, 20 are headed for the U.S. Â We are honored to be receiving 1 of the most influential synthesizers of the last 50 years. Â Make no mistake, this "reissue" is being built exactly like the originals. If you are a true analog synth lover you will appreciate the built-in tuning instability and interference susceptibility that separates true analog synth from its modern digital counterparts. The discrete 901 series oscillators are coveted for their organic sound and were not found on the previous Legacy Modular models (Model 15, System 35 or 55). Every Synthesizer IIIc will be built using all-original documentation, art, and circuit board files. Each instrument features thirty-six hand-stuffed, hand-soldered modules, including ten 901-Series audio oscillators, the 984 Matrix Mixer, and the 905 Spring Reverb. 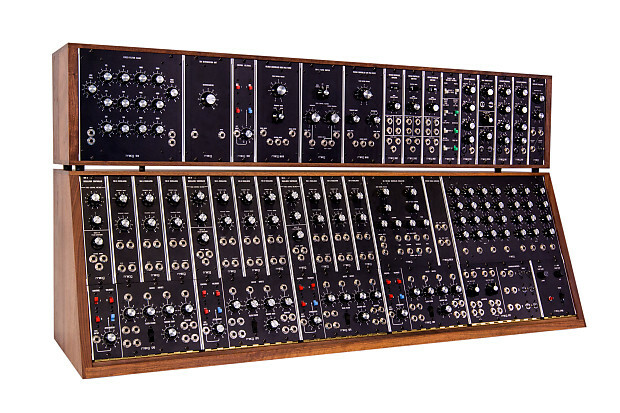 All modules are securely mounted into two hand-finished, solid walnut console cabinets at the Moog Factory in Asheville, NC. In 1965, Bob Moog began taking orders for individual modules and customized modular systems. By 1967, he and a team of ten skilled technicians were hand-building production models in an unassuming brick storefront in Trumansburg, NY. Â The cutting-edge musical instruments that they called â€œsynthesizersâ€� signaled electronic musicâ€™s maturation from an awkward and shy intruder in the realm of music to a dynamic and significant medium of musical expression. The first models were aptly named Synthesizer I, II, and III. With the introduction of the Moog Synthesizer IIIc -- the â€œcâ€� referring to the walnut â€œconsoleâ€� cabinet -- musicians could purchase a complete instrument pre-configured for logical access to a range of facilities usually associated with the largest classical studios. Each synthesizer took weeks of patient, steady crafting to complete, but the payoff would be rich -- a tool that would change the landscape of music. The world got turned on to the idea of the synthesizer -- and electronic music -- through the visionary works of experimental musicians like Wendy Carlos and Isao Tomita. Sonic masterpieces like Switched On Bach and Snowflakes Are Dancing were made possible by the early modular Moog Synthesizers. These original modular systems designed by Bob Moog are inimitable in sonic character and remain highly coveted for their limitless reconfigurability and vibrantly organic musicality. We offer full refunds for unopened and unused products, in their original packaging, in good condition returned to the Washington Music Center (11151 Veirs Mill Rd., Wheaton, MD 20902) in person or via a return shipment seven days after the purchase date. A copy of your original receipt is required with the product in ALL cases. Within 14 days, we will issue store credit under the same conditions. All other return inquiries will be assessed at a minimum 15% restock fee, subject to inspection of the unit to be returned and at the discretion of management. Cost of shipping will not be refunded for items shipped to you, or for rush delivery to the store. This includes the cost the store incures on free shipping orders. Returns are NOT accepted on the following items due to health and/or licensing regulations: harmonicas, mouthpieces, microphones, software, books, CDs, DVDs, strings, reeds, headphones, in-ear monitors, bulbs, tubes, raw speakers, layaway deposits, special order items. We do not offer returns/refunds or warranty support on products shipped outside of the United States. Some manufacturer warranties will be voided if an item is shipped outside of the United States. Here’s what we’d like you to remember: Chuck Levin’s Washington Music Center always has been and remains a family-run business in practice and in spirit. That means we understand the need for flexibility in specific situations. There’s always a Levin at or near the store to address your concerns, answer questions or discuss any matters of importance to you.